13:26 | ¿Is not your local time? Change it!13:26 | ¿Not your time? 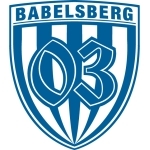 Teams › Germany › Sportverein Babelsberg 03 e.V.